James is in the process of trying to help the One Hut Village who recently lost their home to a fire. I see the childrens bellies full of worms, no food around. This breaks my heart to no end. These are tough times for NHA, as we try to raise the money to complete the Compound building in Kabala. Material, labor costs are rising and are time is limited. James and family must vacate the house in Freetown come May 1st and we are in serious need of preparing the Kabala Compound to make it at least acceptable for living. 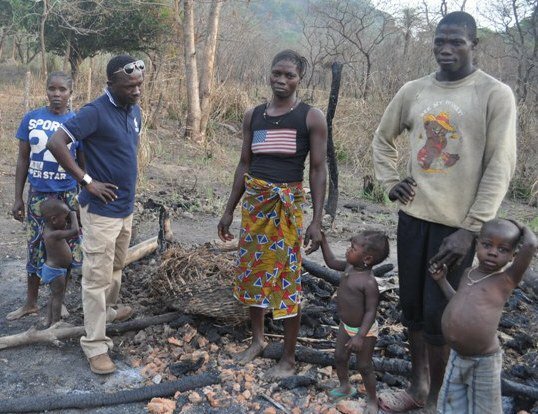 In the midst of this, One Hut's house burns down, Kamasorie Village needs attention. More and More needs are being presented to us, requiring more from NHA to meet these needs. Our school needs provision to further the education - their tool to further development of the village. These are not simple needs, but are desperate situations requiring our immediate aid. People that are sick, children that are hungry, with NO means to continue without us. Please consider these people, your brothers and sisters - think of their lives and come to their aid. Please give today.